A long time ago, Hungary was a nomadic nation who chased horses on the plains. After settling down, she became a powerful nation that had been dominating Central Europe for about 600 years. In the past, she used to beat up Austria, but because other nations weren't really nice to her as she got older, she came to love Austria because he was kinder to her than anyone else. The Monarchy of Austria-Hungary was a compromise that said that they would support each other in a fight, and since then she’s helped him out several times. Her relationship with Prussia is more or less as longtime rivals. As children, Prussia always assumed that Hungary was a boy because of the way she talked and acted (not to mention that Hungary herself was convinced that she was male). Because of this, he picked on her and made fun of her hardships. It wasn’t until Prussia found Hungary wounded after battling the Ottoman Turks that the two of them both realized that she was, in fact, a girl. Since then, the two have been on somewhat bad terms, but Hungary often states that even though she hates Prussia, she would be very lonely if he died or if something else ever happened to him. She was also picked on by Mongolia and Turkey (then the Ottoman Empire) as a child. When she was working in Austria’s house with Italy (then Chibitalia), she acted like a mother to him. She was the only person who knew of his true gender, but despite this, she often dressed him traditional Hungarian costumes and garments worn by women. She doesn't get along with Romania to the point where she uses the names of famous Romanians to name her dogs. In response, most jokes native to Romania are about Hungarians (much like the “Polack” jokes or “In Soviet Russia...” jokes that most are familiar with). Her personality is introverted, but she works hard behind the scenes. She is a great friend to have, but a fearsome enemy to have as well. At first glance, she seems to be a beautiful and ladylike maiden with a wonderful singing voice, but sometimes her tongue slips and her potty mouth from her wild days as a horse-riding nomad rears its ugly head. Hungary likes flowers, and is almost always seen wearing some in her hair, which are said to represent Lake Balaton (found in the western central area of present day Hungary). 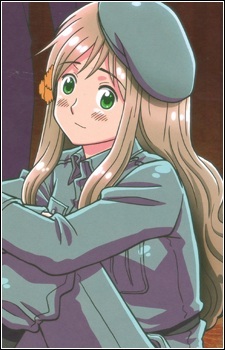 As shown in several strips, Hungary appears to be somewhat of a fujoshi, and is noted as being the manliest character in the series, despite the fact that she is a woman. As her weapon, Hungary wields a frying pan that she usually carries around with her to hit Prussia with. Though her most recognizable outfit is her green military uniform and matching beret, she's been seen wearing nothing but traditional Hungarian costumes and garments when drawn wearing other getups. Also to be noted is that Hidekaz Himaruya initially intended for her to be a cross-dressing male, a role that was later given to Poland who was originally intended to be female. The original Hungary character design was actually recycled and used as Lithuania's basic design.